People’s Bureau is an installation in the Elephant & Castle shopping centre. Through workshops of skill exchanges between individuals from local communities, the project aims to make visible the diversity of cultures, skills, networks and resourcefulness present in an area that is currently undergoing large-scale redevelopment. The project takes inspiration from the informal and fluid character of the shopping centre; a place of social as much as commercial exchange. It may be understood as a microcosm of the area itself. People’s Bureau is intended as a rallying cry against the crude and merciless logic of corporate capital. It is intended to distill and to highlight:. 3) Economic alternatives to cycles of consumption and destruction that, through emissions of gases, now threaten the future of life on earth. People's Bureau is Associate of Tate Exchange and will be based at Tate Modern (January - June2017), hosting a programme of exchanges and public discussions with other Associates and the public around the issues concerned with the ‘foundations of our city’. People’s Bureau is devised and produced by Eva Sajovic and Rebecca Davies. Their practices as artists centre on social engagement and participation. The People's Bureau has come about from the pair's many years of work in the area, collaboratively and individually – most of which is now represented on this website and under the umbrella of the People’s Bureau. Imagery presented here is a selection of moments from the trajectory of the project. To find out more please visit dedicated website here. People's Bureau dedicated shopping cart based in Elephant&Castle shopping centre. PB at Tribe Festival, Tate Britain, October 2015. A short film presenting The People's Bureau. People's Bureau started as an idea that was presented at a scoping meeting with 30 women from LAWRS in Spring 2014 and then test run as a pilot in an empty unit of E&C shopping centre. The pilot which took place, 30, 31 May and 1 June 2014 was supported by Tate Modern. The selected images that follow illustrate the pilot. For the full programme of exchanges during the pilot and more visuals please visit the blog. People's Bureau Pilot project in a shop unit in E&C shopping centre, May 2014. Supported by Tate Modern. Language was one of the exchanges during the pilot. The pilot was successfully received which was also confirmed in an evaluative report written by Patria Roman. To continue the project we requested an empty unit, but since none were available at the time, we were offered a shopping cart. Over a period of three months during which the workshops with exchanges continued, we tested how the cart could support the project. We realised its flexibility and mobility are useful. The cart was redesigned to provide for better storage, foldable trestle tables, a new roof and wheels' support. PB with LAWS and Rockingham Women. Monthly workshop session: massage exchange (front), embroidered bunting making (right); bread fermantation (back). Women working on an embroidery piece for canope extension to the shopping cart. Screenprinting with Tal Drori and Pechkam Print Studio, PB E&C Shopping Centre, 2015. Fermentation for bread making with Andrea Gunther. Embroidered bunting with the Rockingham Women. PB cart was redesigned and launched as part of Moose on the Loose, residency at at London College of Communication, 14-21 May 2015. We delivered a surrounding programme of events: +Opening The Archive to the community (14 May); + May Pole Dance with a procession, taking the cart back from LCC to the shopping centre and Bingo performance (19 May); + My Corridors Will Remain, participatory reading workshop with Prof. Andreas Philippopoulos-Mihalopoulos (21 May). Opening our archive to the academic and local community at Moose on the Loose, LCC, May 2015. During the residency the PB cart was based in the Typo Cafe. After a PB Maypole dancing outside LCC accompanied by live music, PB proceeded in procession to the shopping centre for a Bingo calling event. During PB monthly workshops PB community so far exchanged in many varied skills including consultation for bereavement and loss, bread making, CV surgery, sewing, knitting and crocheting, pedicure, massage, facials, gardening, baking, vegetable fermentation, light workshop, embroidery, dreamcatchers making, sketchbook making, finance consulting, fix&mend sessions, tarot cards reading, spoon engraving, leather wallets making, singing and dancing and many more. PB is constantly looking to engage with new individuals and groups and is open to new proposals for exchanges and collaborations in celebration of collective knowledge. 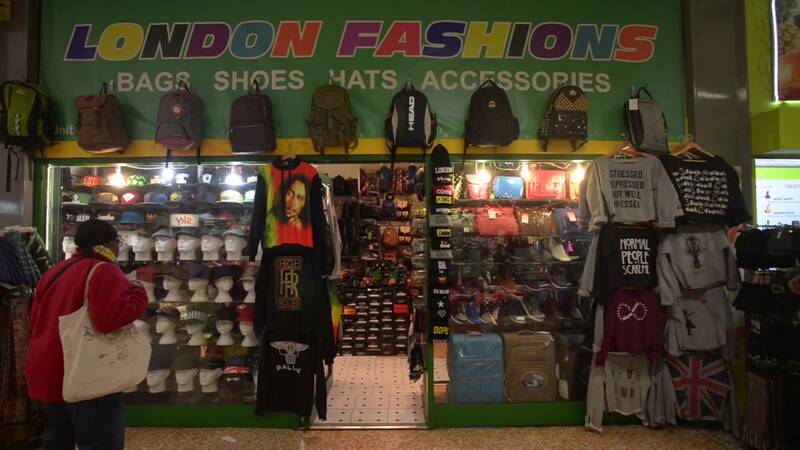 PB, Bring & Fix with HourTime Peckham. Tarot card reading with Rosalie. Red Jan cuttings with Corinne. Memory&Place, collaboration with Siobhan Davies Dance, Entellechy Arts, Nightinghale Choir and Elderly Homes in Southwark. Over several sessions at the cart, off sites visits to the homes and rehearsal sessions the work resulted in a durational performance taking place on the 19 April 2015 at the PB in E&C shopping centre. 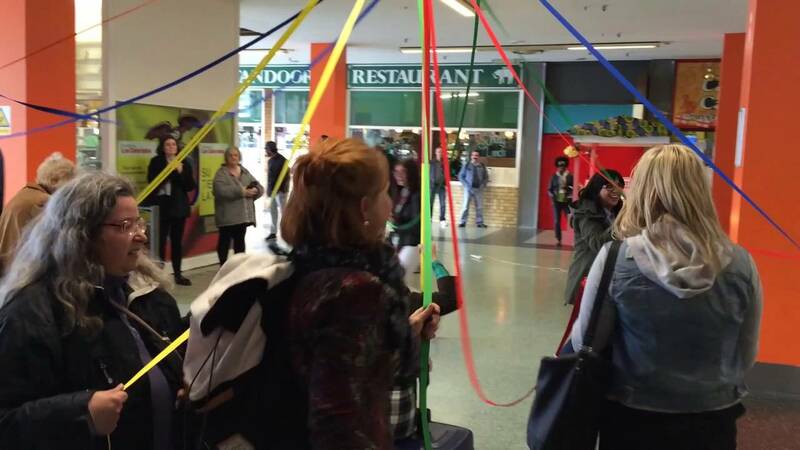 Georgina reciting her poetry, PB at E&C shopping centre, April 2016.
participatory durational dance performance with Siobhan Davies Dance and Entellechy Arts. April 2016.